In the spirit of collaboration and community revitalization, the East St. Louis Park District has formed a unique and dynamic partnership with local community and neighborhood groups to make Jones-Hall Park (the largest municipal park in East St. Louis) a catalyst for community development and neighborhood cohesiveness. The Neighborhood Technical Assistance Center, an outreach program of the University of Illinois Urbana-Champaign, embraces a philosophy of grass-roots or bottom-up planning and is helping area residents fulfill a dream of having a vibrant and attractive neighborhood. Although the local tax base is insufficient for the park district to accomplish much of what it would like to, and grant dollars are increasingly hard to get, neighborhood association members have not given up. Area residents now are banning together to make the revitalization of a major park asset the cornerstone of neighborhood pride and activity. During its heyday, the 130-acre Jones-Hall Park was a jewel, located at the doorway of the Lansdowne neighborhood, the most populous and elegant in East St. Louis. The park was a gathering place not just for local residents. Visitors would travel two hours to hold a wedding, anniversary celebration, church picnic, family reunion and other events on its grounds. There, they enjoyed a beautiful large fountain, the early 19th century boathouse or went fishing or paddle-boating in the lagoon. Local kids and teens could not wait for the warm days of summer to splash in the park's pool. Team baseball and track events were commonplace in the park. However, the 1980s seemed to mark the last days of widespread park use. Consistent with the urban disinvestments and financial indebtedness that was evident around the entire city, the park witnessed its share of neglect and abandonment. A huge crack in the swimming pool and a limited park district budget took this popular attraction out of commission. Throughout, the park deterioration quickly began and resulted in a downward spiral of declining use from adults, children and visitors. 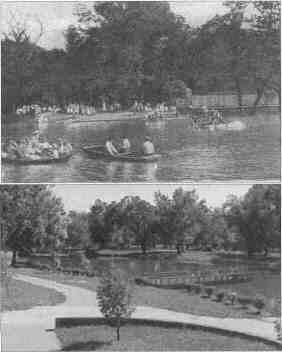 When compared with parks in other more prosperous communities, Jones-Hall Park could no longer compare. This evolving story of a local association working diligently to take back their neighborhood and city, and using parks as a catalyst, reaffirms what the parks and recreation profession is all about. In the early '90s only a handful of residents could be seen taking an early morning walk around the park. There was no programming, and virtually no activity took place after dark. Although the park district was doing all it could with a very limited budget, the need for resourceful partnerships was recognized as the only viable solution. Action began and the East St. Louis Community Development Block Grant Program awarded money to the park district to repair the cracked pool and construct a small water park for area youth. Then in 1999, a second sign of life occurred that sparked the community to rethink its commitment to the park. The new state-of-the-art Jackie Joyner Boys and Girls Club was built in the park and gave everyone new motivation to visit. At the same time a new lightrail train stop provided city residents with convenient access to it and the park. Today 150 to 200 youth visit the Boys and Girls Club on a regular basis, enjoying organized sports, educational and cultural programs, professional sized baseball diamonds and, soon-to-come, an Olympic-sized swimming pool. Jackie Joyner grew up in this neighborhood of East St. Louis. Her foundation has built this facility and hopes to make other enhancements to the park. Top: A postcard circa 1920s shows East St. Louis' Jones-Hall Park in its heyday. Bottom: The park lagoon as it looks today. heart of this plan was to turn a neglected asset into the catalyst for community and economic development. One goal for the committee was to reintegrate the park into daily community life. To do so they have devised an exciting plan, which includes the restoration of a creek and a development of a walking path connecting the entire neighborhood. In the early 1900s there was a creek that flowed through the neighborhood but it was engineered to flow underground to make room for residential development. Currently, the property that lies over a big portion of the creek is one large vacant, overgrown and trash-filled area. During the planning process, residents identified this property as a nuisance and wanted to see some improvements. The Lansdowne Steering Committee along with an architecture class at the University of Illinois developed an idea of restoring this creek to the surface and connecting it to the park with walking and bike trails, attractive landscaping and paths with educational activities. Preliminary negotiations are now underway for the property owner to donate it to the organization. This project will encourage residents to utilize the park and its resources. • installing benches around areas of the park that need them, including the playground area. Lansdowne residents astutely have seen the potential of neighborhood building through parks and recreation. Although the vision is huge and accomplishments will be measured incrementally through a lot of hard work and inevitable setbacks, it is hard to believe success will not be accomplished. This evolving story of a local association working diligently to take back their neighborhood and city, and using parks as a catalyst, reaffirms what the parks and recreation profession is all about. History will be the final judge, but quality of life improvements provided by park and recreation may ultimately play a significant role in revitalizing this beleaguered city. is a community planner for the Neighborhood Technical Assistance Center INTAQ of the University of Illinois. is associate professor in the Department of Leisure Studies University of Illinois at Champaign. His last article for Illinois Parks & Recreation magazine 'Eventing the other Festival Trends" appeared in the September/October 2000 issue. Lighting grant, volunteers for park improvements, lead role on planned park-related improvements including creek restoration, finding resources for park improvements. Increased park utilization by being located there. Finding resources for replacement of tennis courts and playground. Funding for lagoon restoration and tree replacement.